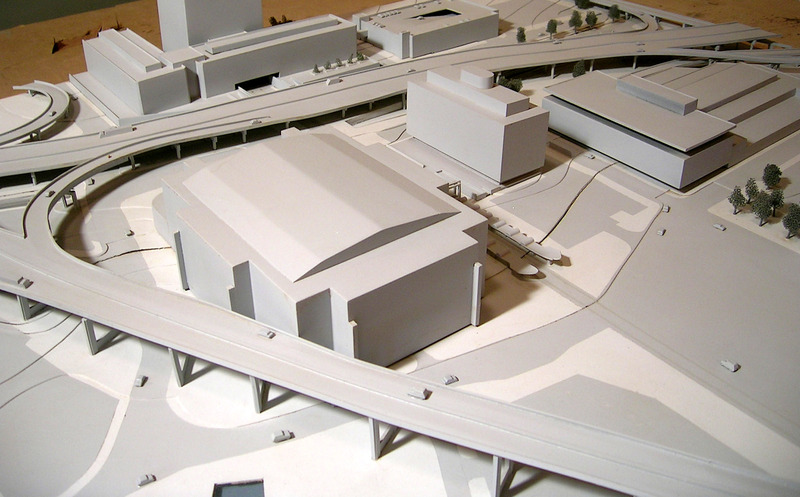 This warehouse model is an excellent example of the visual impact an architectural site model can have. Basic shapes, and a clean design create a very clear communication tool. The purpose of this model was to show both the interior and exterior of a new warehouse our client is building. The interior features rows of racks where product is stored as well as the layout of the offices. The exterior of the warehouse model includes simple landscaping, roads and trucks. The topography does an excellent job of framing the interior features of the warehouse building. Most of this model was programmed and cut on our shop laser. It was built using PDF’s supplied by the client. The finished warehouse model will be displayed under Plexiglas in the corporate lobby. 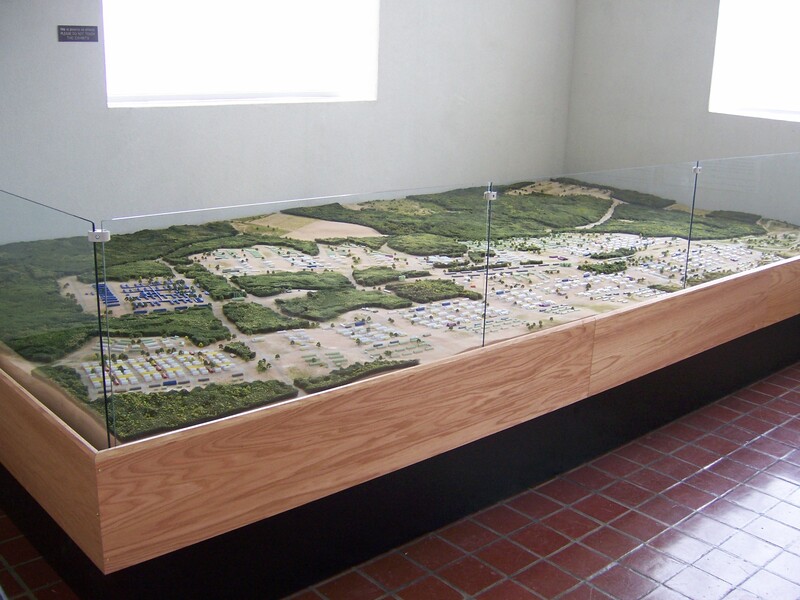 This historical site model was created for a museum in Western NY. The interactive display depicted Ganondagan, a community of Seneca people living in the early 1600’s. 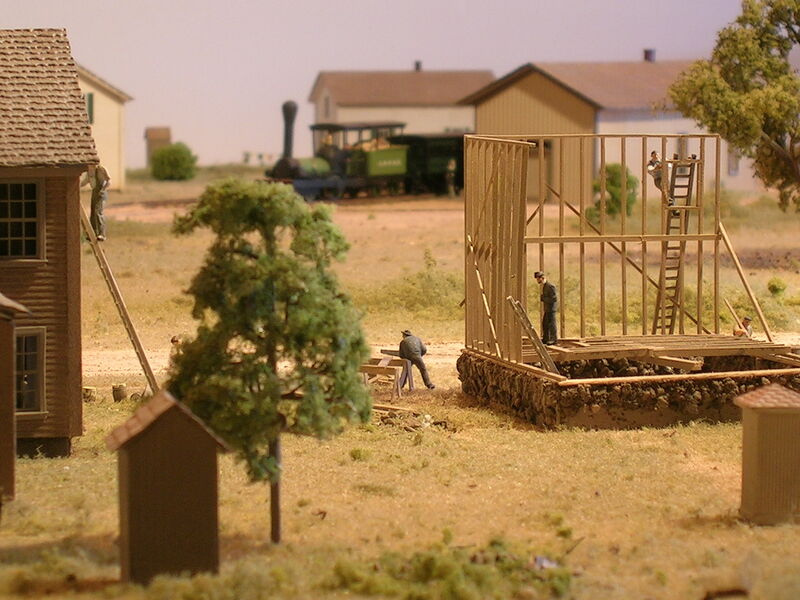 A large swath of land needed to be included on the site model, therefore the scale was quite small: 1 inch = 100 feet. With such a tiny scale to work with, the landscaping was particularly important, otherwise the model risked looking boring and monotonous. There were no buildings to focus attention on other than a cluster of tiny longhouses, and no major geological features to provide excitement. The time of year the client wanted depicted in the model was early fall. Research needed to be done to find the exact textures, shapes and colors which would realistically represent this time period. 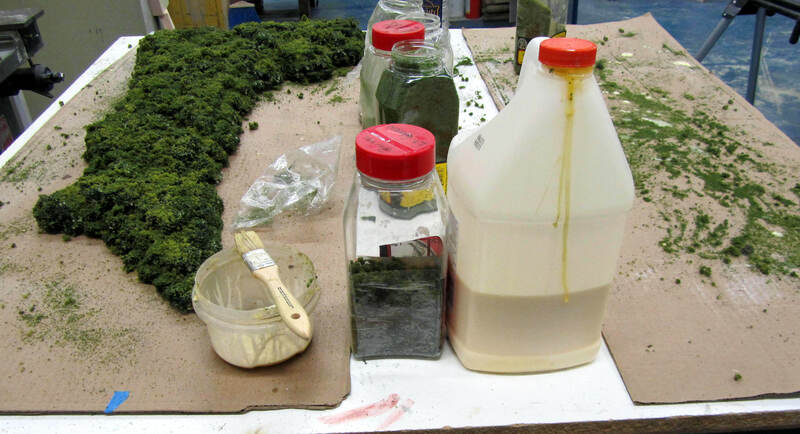 The team at KiwiMill experimented with various materials to accurately represent grasses, trees, corn fields, and water at such a tiny scale. 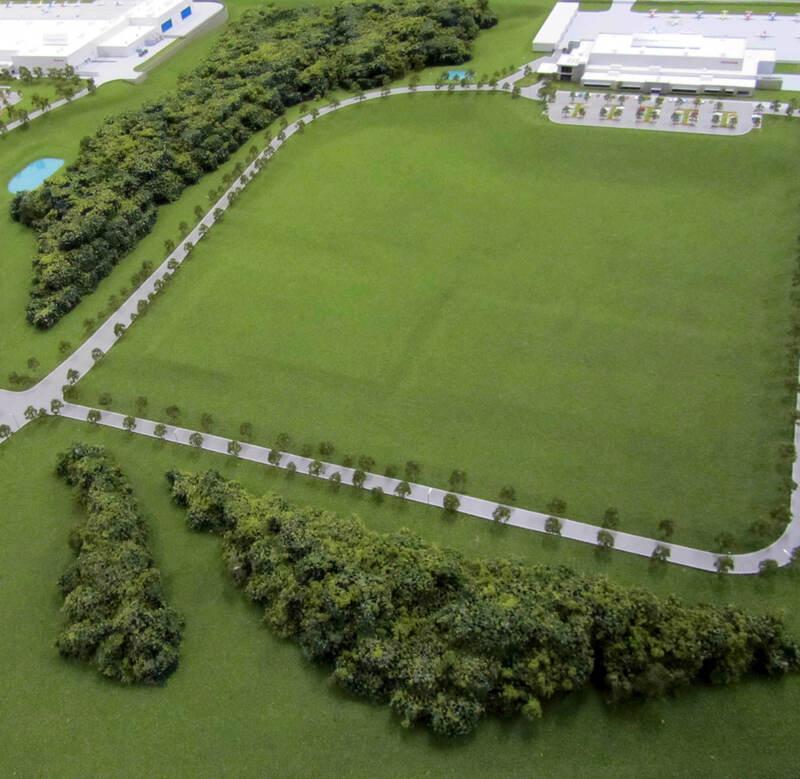 The site model was designed to light up various areas of the landscape as well. The corn fields, wooded areas, water sources, walking paths and gathering of longhouses all needed to light up at the push of a button. LED strips were imbedded into the surface of the model and electronically connected to a control panel. The electronic knowledge required to get each area to light up correctly was complex. The topography base was made out of a block of foam, and programmed and cut with a CNC router in house. The slots for the LED lights were cut at the same time using the router. Once the foam base was cut and sanded, the LED lights were inserted, the wiring underneath was completed and the extensive landscaping added. When the model was completed, it was carefully wrapped and transported to the museum’s gallery for installation. A local landfill is running out of space. They need a site model to show what the expansion will look like. 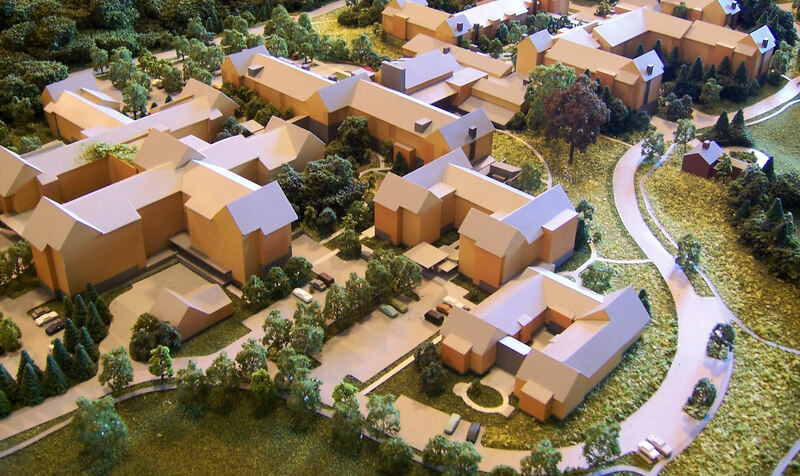 The site model will be used to inform the local community as well as secure approval from local government. Topographic maps are provided by the engineers of the landfill project and are used to build the site model. Our model makers have made use of Google images as well for the accurate depiction of the affected land. The base of the site model is hand sanded foam. 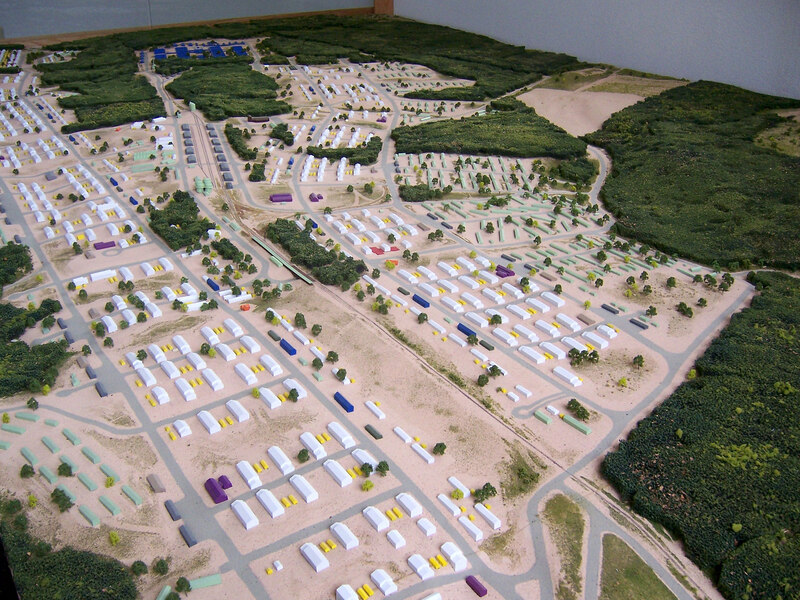 The landfill mass in the center of the model is drawn in a 3D computer program and then CNC routed. Flocking is added, along with laser cut roads. The scale is 1″ = 200 ft. The site model covers a roughly 3/4 mile by 1/2 mile area. 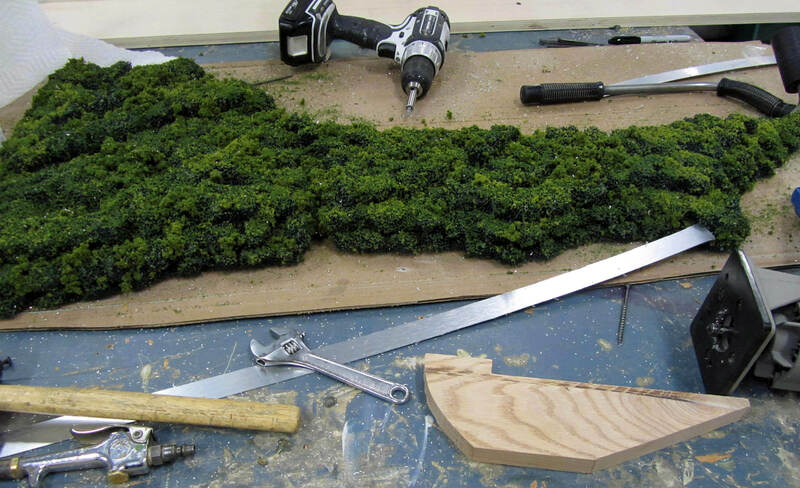 Ever wonder how to make wooded areas on a small-scale site model? After much experimentation over the years, KiwiMill settled on a method that captures the essence of this particular landscape. 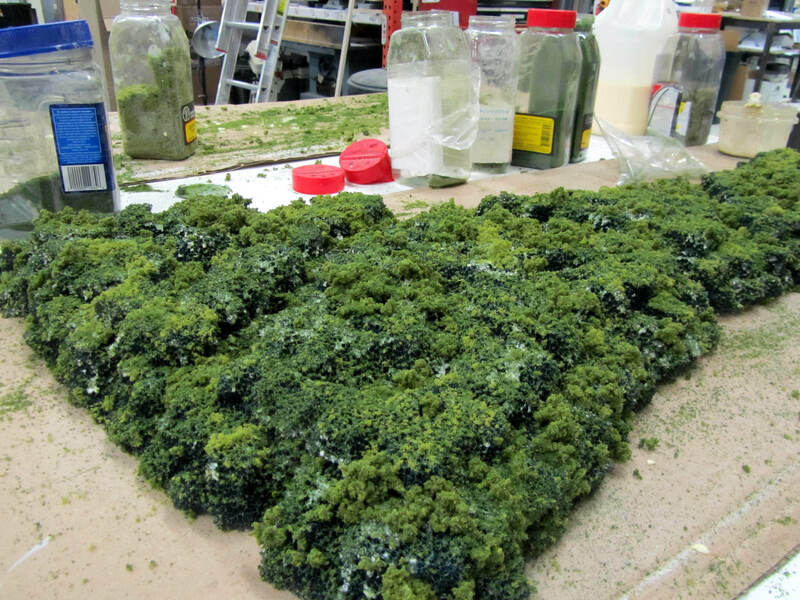 Interestingly, it does not involve planting hundreds of individual model trees close together. No matter how tightly placed the trees, this method still lets in too much light – not realistic looking for a densely wooded area. Instead, industrial filters – the kind used in air conditioning units – form the base for the wooded areas. These filters are then hand-sculpted by the model makers. Depending on the over-all scale of the model, these sculpted pieces are layered on top of each other. Three layers of 1/2 inch thick filters represent 60 ft high trees accurately. 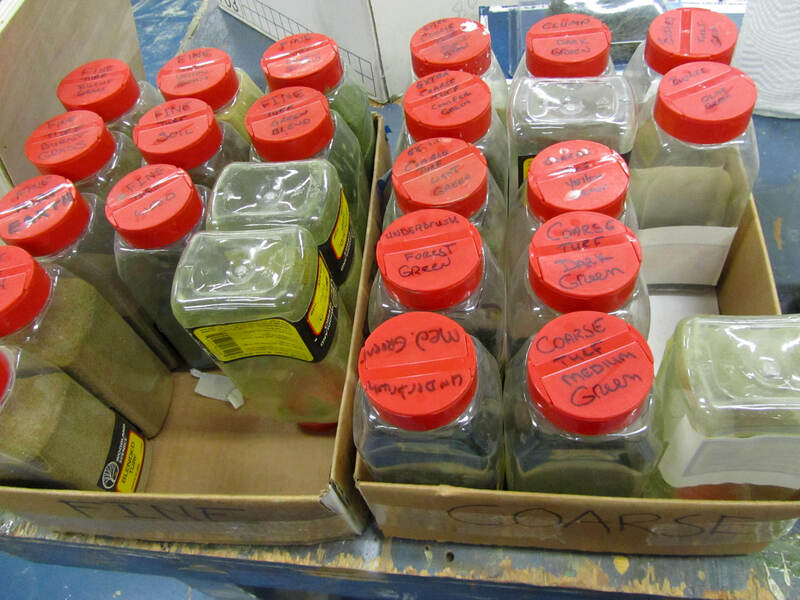 The layers are painted all over the surfaces with glue and flocked with various natural shades of green, brown and yellow. 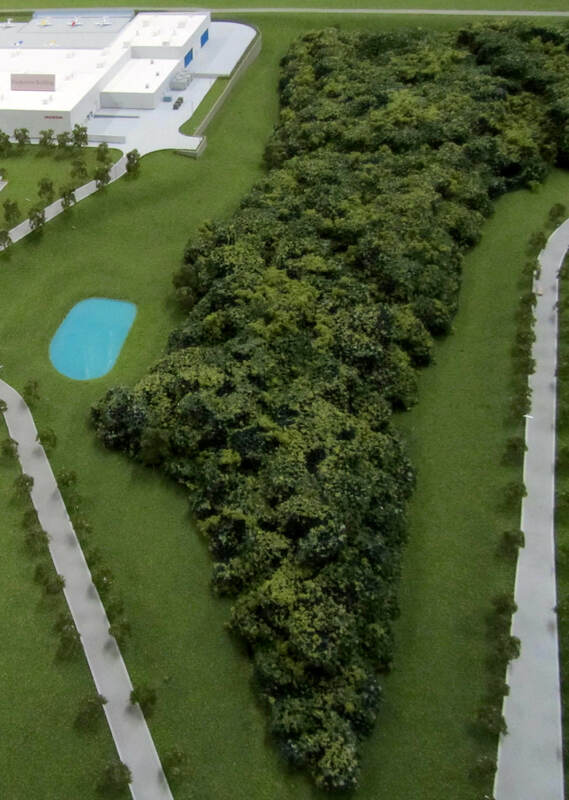 When placed on a site model they represent small-scale wooded areas with depth and lushness. Architecture is probably the most frequently modeled item other than modes of transportation (trains, planes, boats and vehicles). 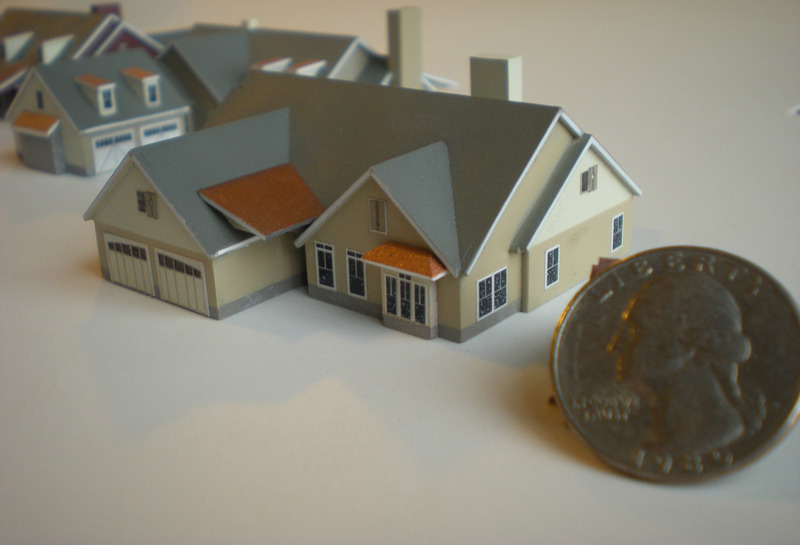 Most people have encountered a scale model of a building, house, interior space or community at some point in their lives. Virtual 3D walk-throughs of structures are available with new technology, but nothing has replaced the usefulness, the appeal and the impact of a physical representation. 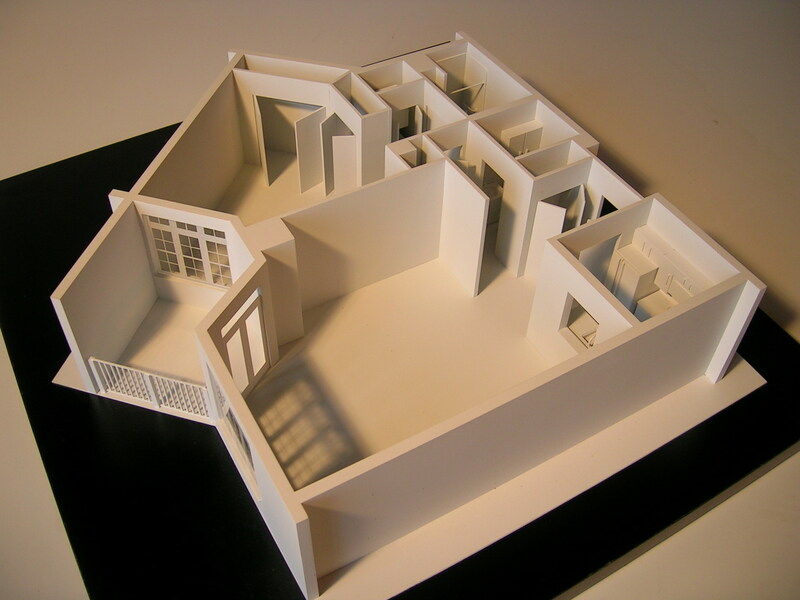 There are sub-categories within these architectural model uses, as well as overlapping purposes. It’s up to the professional model maker to extract from the client the essence of what needs to be communicated with the project. This helps drive the type of architectural model that will be built, along with what scale to use. There are simple massing models where monochrome cubes or blocks might be used to represent buildings, emphasizing placement of structures and their context. Detail level on models of this type is typically minimal to accentuate the physical space in relationship to its surroundings. 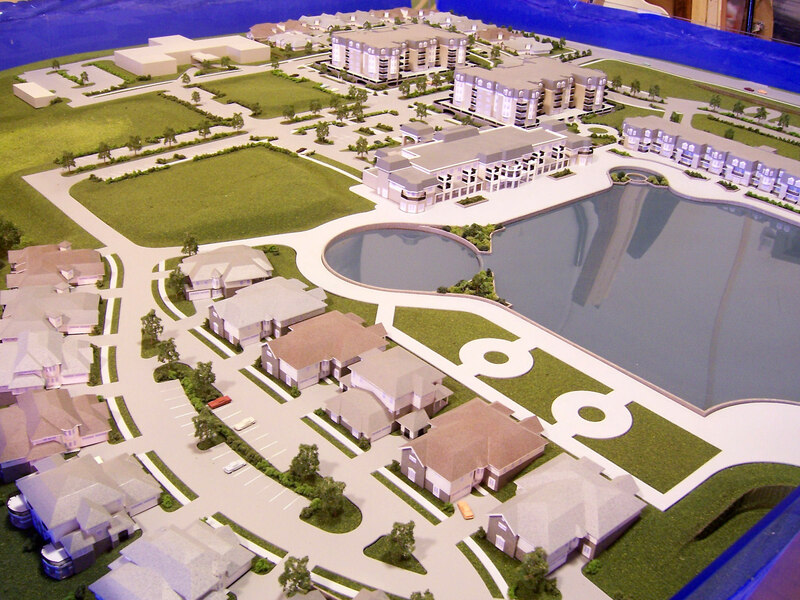 Site models depict buildings and the areas around them, such as roads, parking lots, landscaping and cars. 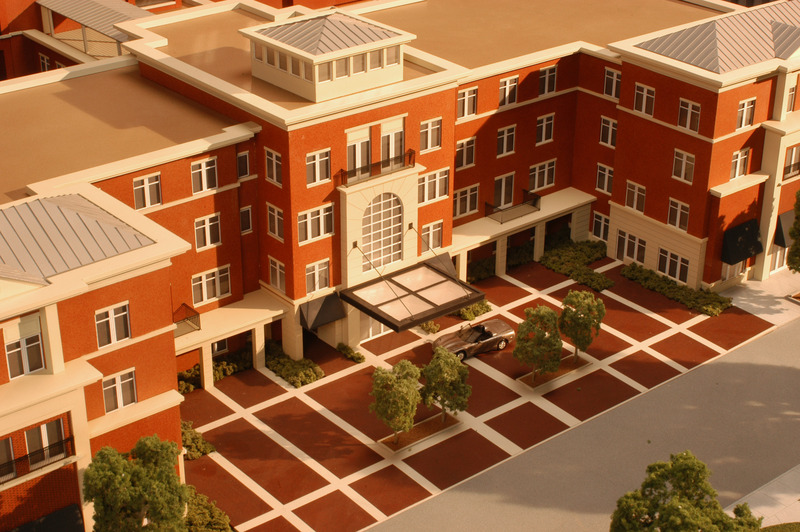 Architectural models used for display are often very detailed and include such things as lush landscaping, lighting, and other highly realistic features. 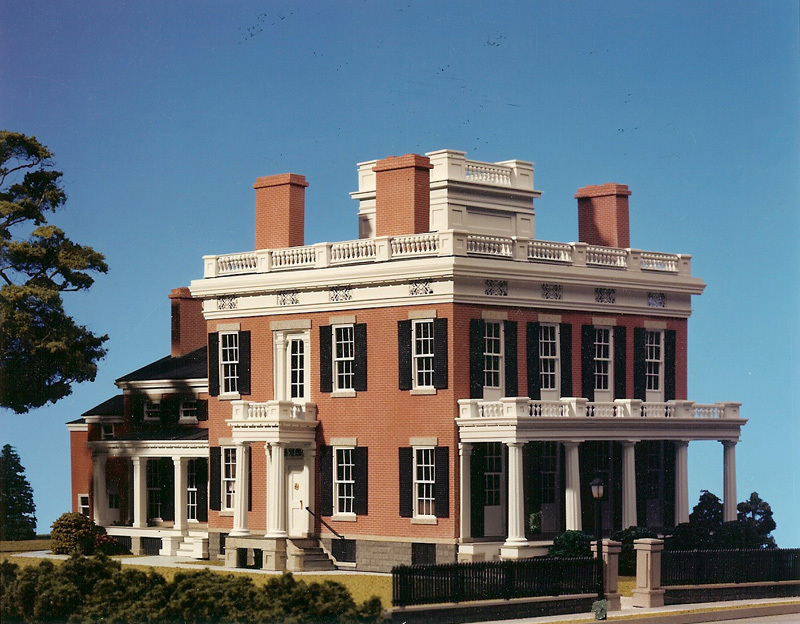 A museum quality architectural model is expected to last generations, be made of the finest available materials and represent a master model maker’s most meticulous work. Interior models show exactly that – what’s inside a space. They may involve lift off roofs or side cut aways for viewing. They might have very detailed furniture, finishes and miniaturized accessories, or be a simple design that emphasizes lay out and flow of rooms. 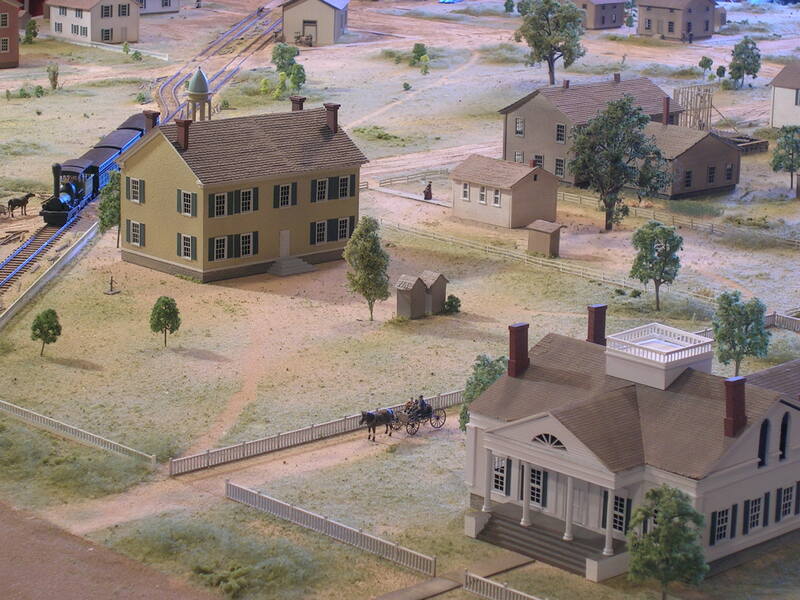 Urban models typically depict larger areas, whether it be city blocks, part of a town or a whole community. Detail can vary greatly on these as well and is usually determined by the scale that was chosen for the project. 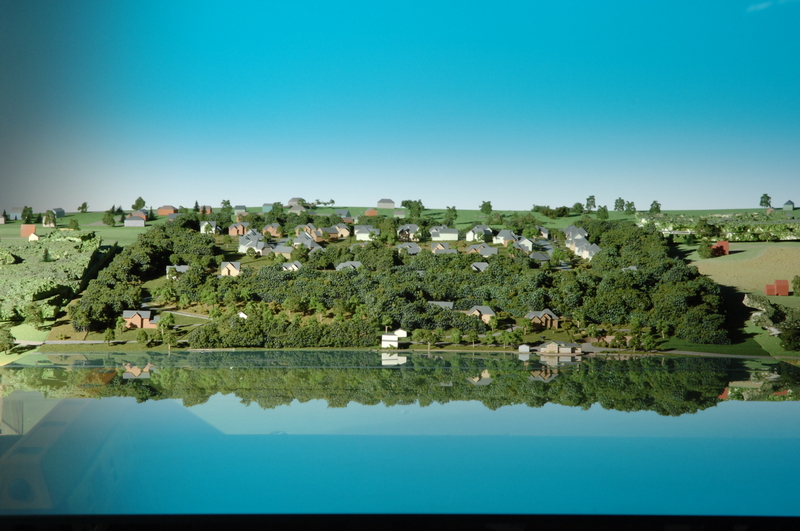 Landscape architecture models emphasise the trees, plantings, grasses as well as any structures, bodies of water and unique terrain features that might be included in the area depicted. Architectural dioramas attempt to tell a story visually. They include all the elements necessary to represent a place or moment in time. They may not be completely to scale, but depict objects in the background purposefully smaller in order to give the illusion of depth or distance. Topographic models show the elevations, shapes and features of a particular land surface. There are other types of architectural models but the importance lies in matching the purpose of the model with its design. Similarly, scale is chosen by determining what the model needs to convey. 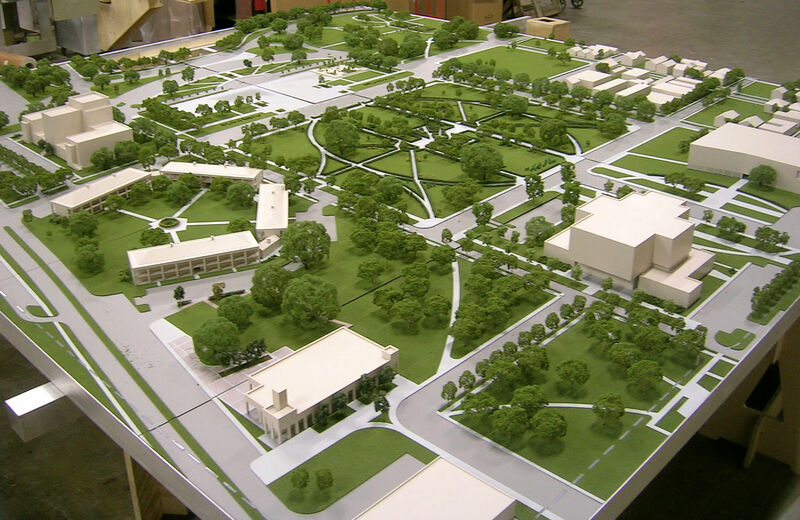 Two main questions need to be answered when determining the scale of an architectural model. How much area needs to be covered and how much detail needs to be shown? When a large area is being depicted, such as a site map, the scale is usually smaller. This way more area can be displayed without the over all dimensions of the model becoming too unwieldy. Detail level may be lower, in part because things are less visible at a smaller scale. If only one building is being depicted, the scale is usually larger. Detail on a larger scale model is much more noticeable and will have a greater visual impact. 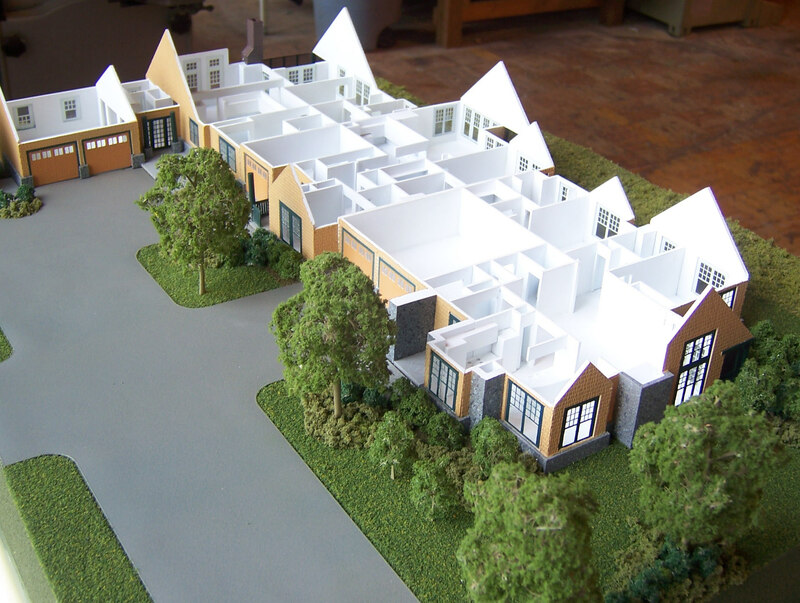 When a model maker communicates well with a client, and exhibits superior model making skills, the resulting architectural model conveys the message that was intended. This is the outcome both model maker and customer strive for. 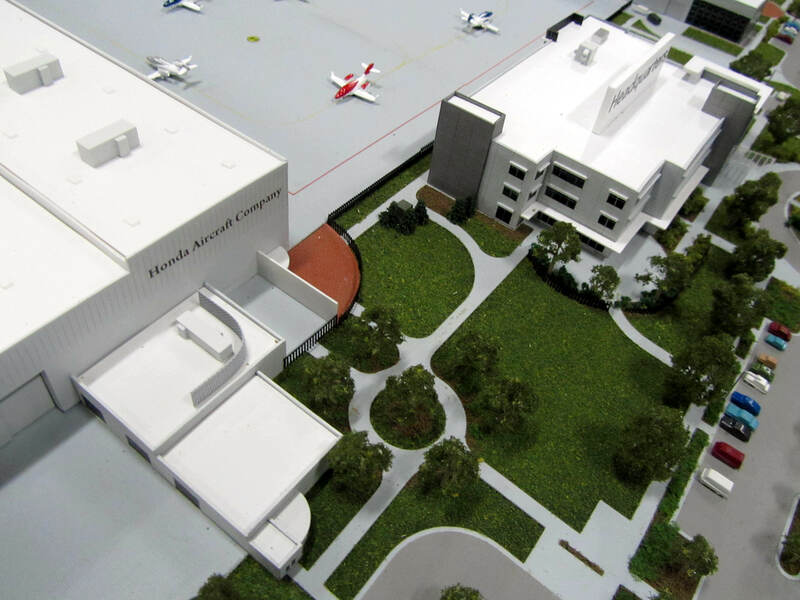 Just Shipped: A site model of the Honda Aircraft Headquarters, Research, and Production facility in Greensboro, North Carolina, located at Piedmont Triad International Airport. 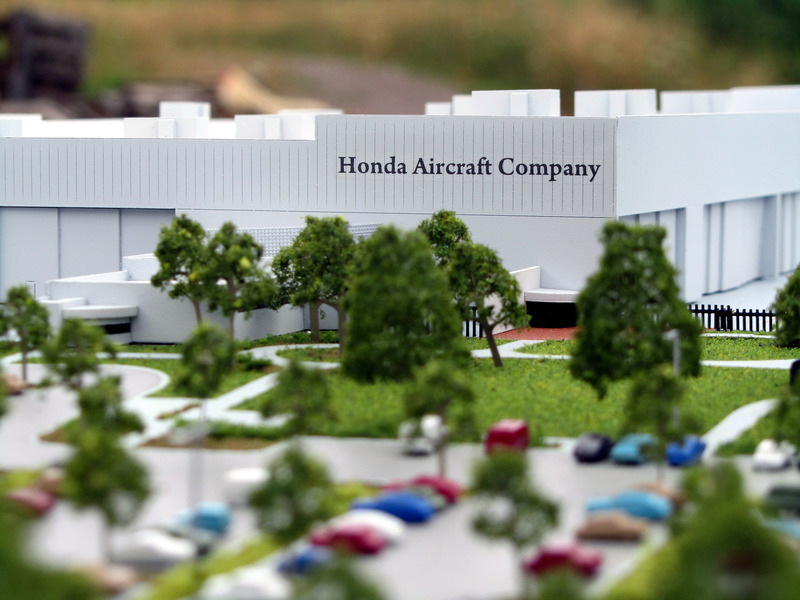 This facility is home to the new HondaJet personal aircraft, scheduled for shipment in early 2012. The site model, along with the aircraft itself, was unveiled this week at the OshKosh AirVenture Show . 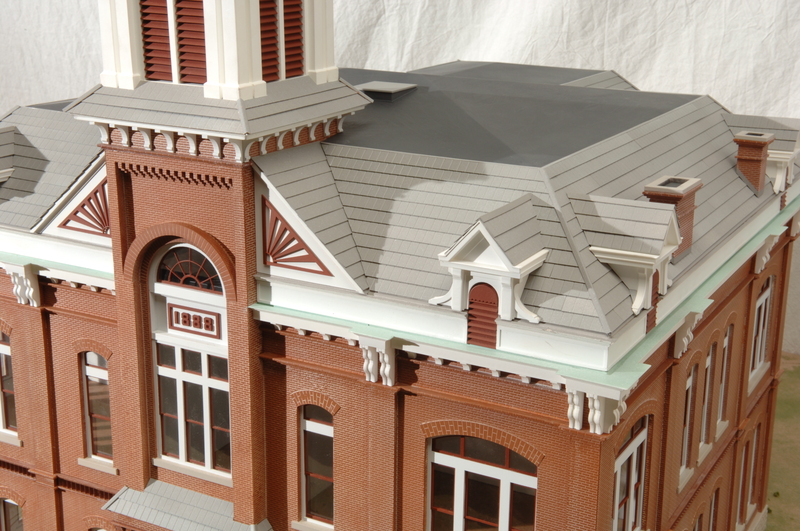 The scale of the model 1″:40′ was very small, which contributed to the over all impact of the finished product.